It's that time of the year again. Yup, soar throats and runny noses are all around. My family doesn't get sick very often, but when we do, I like to keep certain products stocked up in the house to keep everyone feeling their best. 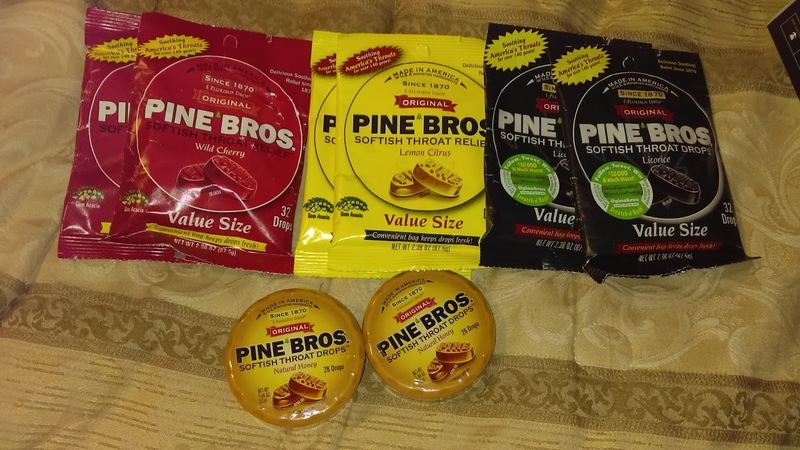 I learned about Pine Bros last year, when I was sent some samples to try out. They are like cough drops, but even better. This year I not only received several packs including ones we enjoyed last year and even a new flavor! We got honey, licorice, wild cherry, and the new flavor-lemon. I also was sent a really soft Pine Bros shirt. I've been wearing it around the house quite a bit because it's very comfortable and fits me just right. These drops are made with natural gum acacia and plant glycerin. 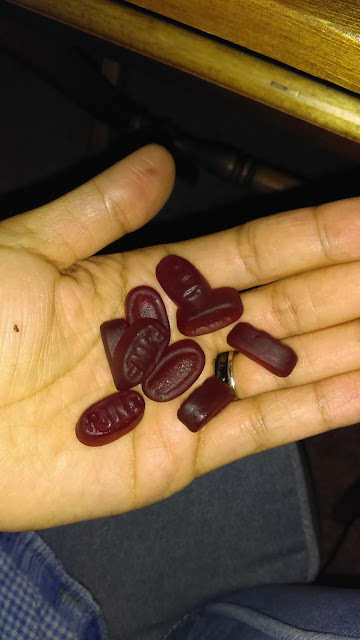 They're not hard like regular cough drops and you can't really bite into them. They are like hard gummies. They take a while to melt and soothe the throat really well by keeping it nice and moist. Dry throats are the worst and can ruin just about anyone's day. Each person in my family has their own favorite. My son and mom love the licorice, my husband loves the honey and wild cherry, and I love the honey and the lemon citrus. They all work wonders on our throats. What I love the most is that they are not actual medicine. They're natural, vegan, and gluten-free! Natural products make me happy. They taste good and you can even pop them in your mouth like candy if you want to. "As different as night and day. Or you could say it's our secret recipe of premium plant glycerin and imported gum acacia, natural flavors and softish consistency. Pine Brothers are more than just a throat drop to soothe your sore throat, they are an experience!"